The Skinny: The greatest tension in this triad drama is whether or not you can stay awake. Not much action or even drama occurs in this triad snoozer. 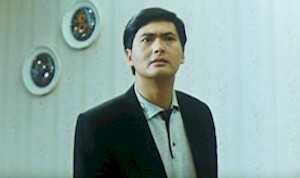 Chow Yun-Fat spends most of the film looking at or listening to others, and that he was able to stay awake himself is something of a miracle. Chow Yun-Fat inherits the triad life in this tepid gang drama and poor excuse for a Chow Yun-Fat film. When his dad (a big triad kingpin) dies, Chow is drafted to lead the gang, which consists of such triad film luminaries as Roy Cheung and Shing Fui-On. Despite his new triad life, Chow is unsure of the criminal element and decides to wait and see how he'll handle the gang. Meanwhile, rivalries and slow-motion montage sequences abound as the various gang members vie for dominance.